How would you like a stable boat with easy access from forward, either side or aft, with carpeted flat floors and seating for 12 friends or family members. Big kids and little ones can move safely about, protected by the anodized rails. All the amenities are in place for an afternoon cruise. 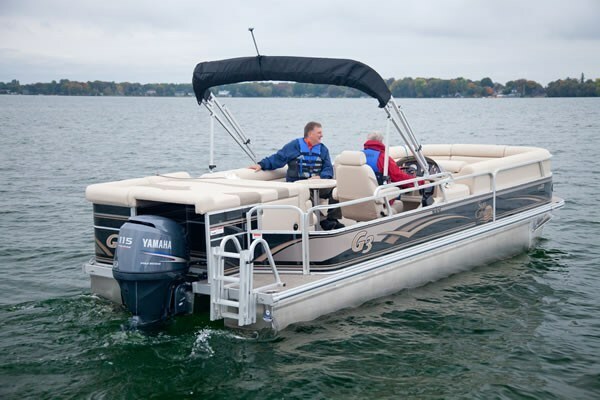 It has a live well with aerator pump to suit those wanting to fish, and a ski tow bar is an available option. The door/gates have a simple lift/lock mechanism for both open and closed positions. No pinched fingers happening here. 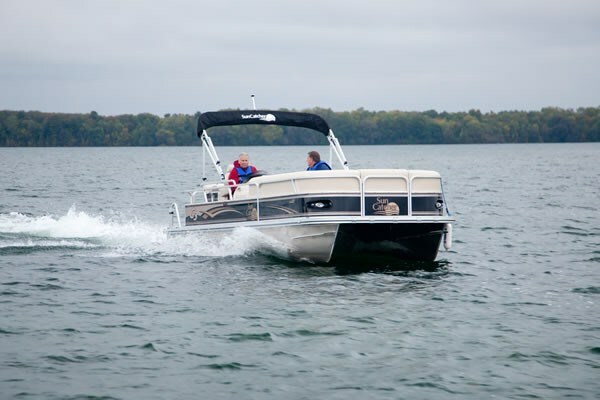 A full 5-year warranty covers bow to stern and external seams are covered for “the duration of ownership” to the original purchaser. At the bow, you’ll find two molded chaise lounges, or seating for six with under seat storage. To keep these storage areas dry, a rain drain channel surrounding each cushion, channels any water away. The extra seat in the XS model designation can be positioned in the centre between these seats or moved to the port side door position. The fiberglass reinforced helm station is mid-ship on the starboard side with even more storage below. An “L” shaped lounge aft, completes the seating, and cup holders are spread throughout the seating area. A huge sun pad aft raises, to expose a retractable, canvas change room. Through the aft door starboard, beside the change room is access to the 4-step boarding ladder, providing easy access back on board from the water. The standard booted bimini stores out of the way above this area and a matching mooring cover for rain and UV protection is standard equipment. An ABS table has mounting receptacles centreline both fore and aft. 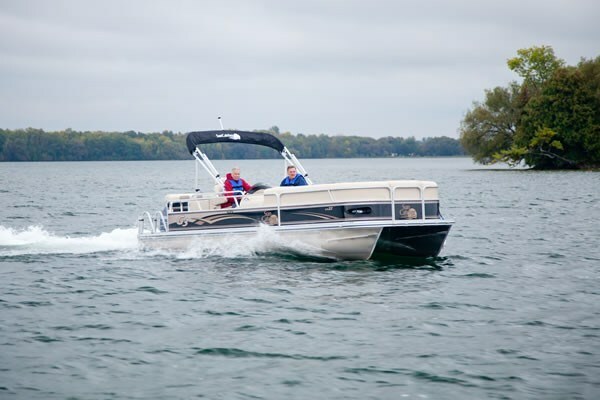 The comfortable helm seat is fully adjustable and the helm has the usual instrumentation including speedo, tach, trim and fuel gauges as well as a Garmin 145 fish finder and Sony stereo with I-pod and MP3 jack. The 4-stroke Yamaha starts instantly, and is very quiet. Yamaha deluxe binnacle controls are smooth and effortless. Steering is straight and true and acceleration is brisk. 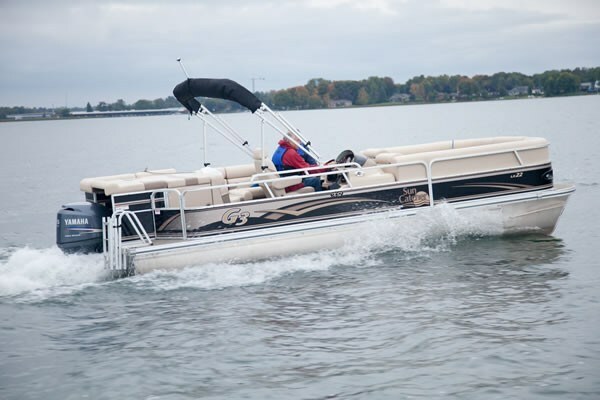 The 25’ foam filled tubes get the boat on plane very briskly and a full-length under deck performance shield keeps the ride dry and quiet. 3500-RPM results in 15 MPH cruise speed and burns only 3.4 GPH for a very economical cruise. Full throttle if you really must go there is just shy of 30 MPH. If you think you’d like one of these, it can be further customized with popular options such as tandem trailer, ski tow bar, front couch, inflatable bed, refreshment centre and a floating ottoman/cooler with cup holders. You couldn’t get more practical than that and there’s something for everyone in the family to enjoy.